In order to meet the ongoing development needs of the Borough, Adamstown Borough embarked on several projects to construct redundancy in its water supply and storage facilities. The initial project included the construction of a 300,000-gallon concrete water storage reservoir. 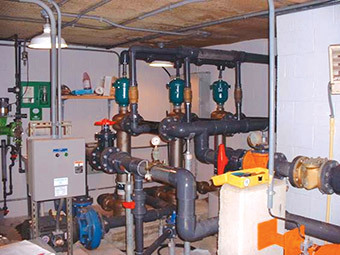 A subsequent project included the installation of a system-wide telemetry system to allow for the monitoring of water levels in the two storage tanks and well pump operations in the three Borough wells from a central location at the Borough’s treatment plant. As the Borough’s Engineer, Hanover Engineering coordinated the work provided by a Geotechnical (borings) Consultant, performed site surveys and construction stake out, prepared project contract documents, coordinated the bidding of the project and award of the contract, and provided construction observation services. The facilities upgrade projects were all funded locally. Hanover Engineering representatives assisted the Borough in establishing a “Developers’ Agreement” process whereby local developers reserved future capacity in the systems, based on their anticipated water supply needs. As a result, future development activities in the Borough will fund a significant portion of the cost of construction of the upgraded facilities.